I found a recipe for these online at PlainChicken.Com, an amazing food site. They seemed so simple, with only a few ingredients, and looked amazing. The base is basic, and you can add whatever pizza toppings you want before you bake them. The best part? I finally had a good excuse to buy myself a mini muffin pan (and yes, I've gone this long without ever owning one and its tragic). note: I can also see these being perfect for things other than pizza toppings- I see cheddar, broccoli, and ham ones in our near future! Seriously- you could put anything in these and I may even throw a little sugar in the dough and do some sweet puffs the next time I'm making them! * serve with side of warm pizza sauce as dip! * Heat oven to 350. * Mix flour, baking powder, and garlic powder together in a bowl. Whisk in egg and milk. * Spray mini muffin tin with non-stick spray. Divide batter between the cups- fill them up to the top- they won't puff up too bad and spill over. The kind you eat... not the kind that I'm desperately lacking. The first time I ever had muscles was shortly after I moved to Ireland. I had no idea where I was going to live, no idea how I was going to live, and was in slight panic mode- but by God- I was going to eat some freshly caught seafood since I was finally living by the water! And eat them I did- an entire buckets worth. New food adventure in a new restaurant, in a new town, in a new city. It was a night to remember, and something I vowed I would do as often as possible. Fast forward 4 years and I'm living back on the coast- fresh and tasty seafood served everywhere- and I'm here with a husband who hates it (or at least anything seafood that calls a shell a home). I have to wait until he leaves for an evening so I can cook it- and on Friday he had a night-flight- so I took full advantage. * Add olive oil to a pan and heat over medium heat. Add diced onion and cook until softened. Add minced garlic. * Add diced tomatoes, tomato paste, and seasoning to onion and garlic mixture, stir, and cook until bubbly. Slowly add white wine and simmer. * Steam muscles until they pop open. Add opened muscles to tomato mixture and simmer for 10 minutes. * Serve muscles in a bowl and pour tomato sauce over them. Eat muscles with a giant scoop of tomato sauce. Enjoy. What's better than stuffing a chicken full of anything your heart desires and baking it? The answer is: eating it! 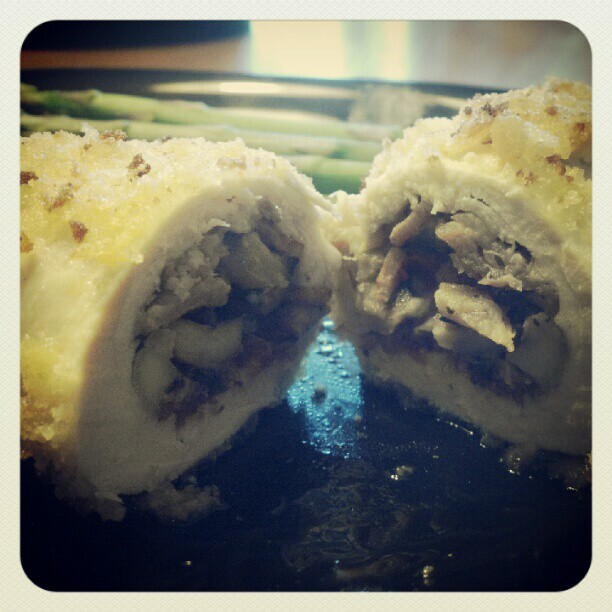 Mushroom and Bacon Stuffed Chicken Breasts. This was by far my favorite of all of the stuffed chickens we've made. I scoped out about 10 recipes and took what I loved from all of them (plus what was available in our fridge without running to the store) and came up with a pretty tasty dish! * Preheat oven to 375. * Place chicken breasts on tinfoil covered baking sheet. Bake in oven for around 25 minutes- or more depending on how thick your chicken is. Mine took about 30 minutes. I've made these TWICE in the last two weeks: first for my friend Jennifer's birthday, and second for BUNCO night. Want to impress a bunch of people you've never met before? Make. These. There was not one woman who ate these who didn't absolutely love them. The only thing I did differently was to save all the extra oreos for the frosting- not mix half with the cake batter. I figured the cupcake would benefit more from having super kickass frosting, especially when the devils food cake is already so rich and delicious! This recipe it taken out of Cuisine at Home (Feb. 2012 edition). I had made a cajun mac and cheese earlier in the month, but given that my husband loves anything with kielbasa, cheese, and pasta- I figured it couldn't hurt to try another recipe. This one is a 'fancier' version of what we usually make in our house- and invovles some cheeses I've never made mac and cheese with before. Look at us- all fancypants with our cheese that really isn't all that fancy- its just not served in 'singles' like the Kraft stuff is. One word of advice: cut back on the amount of dijon used- I had already cut it back in the recipe to appeal to my audience of picky eaters, and it was still strong in the dish! * whisk in flour. cook one minute. whisk in milk, cook until slightly thickened. reduce heat to low. add cheeses by the handful, whisking until melted. * stir in dijon and worcestershire sauce. then add pasta. then add sausage. transfer to casserole dish and sprinkle crumb topping over the top. * bake until sauce is bubbly and crumbs are brown- about 20 minutes. I'll give my hubs some credit here: he made this meal. I was out for the night, and he still cooked what we had planned- so proud! I ate it the next day for lunch, and the leftover chowder was just as good as I imagined it being the night before. * In a dutch oven, combine chicken, corn, and chicken broth. Bring to boil, then reduce heat. Cover with lid and simmer for 10-12 minutes. When cooked through, transfer chicken and corn to cutting board. Besides being delicious, what do all of the above ingredients have in common? They taste good on a sundae, right? That answer is 100% correct, but not the one I'm looking for. The super-correct answer is: They all taste good on a slice of Banana Split Pie. We haven't had dessert in our household for quite a long time thanks to my dieting. I felt as though my husband needed a treat, so I asked him to pick one. Lesson learned: husband is dooming himself to diabetes by the age of 30. Not only did he harass me all day about when it would be 'pie time', but when 'pie time' finally arrived, he ate TWO pieces decked out with almost all of the ingredients seen above. You betcha. The original recipe was taken out of a magazine I have containing a bunch of summertime recipes, but I've altered it so much that I really don't think they are the same at all- I just used the one I found for inspiration. The inspiration for this one called for banana liquor, pudding made from scratch, and a from-scratch nutty pie crust. No, thanks. I like to keep things simple. * Various toppings: chocolate syrup, caramel syrup, pineapple topping, strawberry stopping, marachino cherries, chopped roasted peanuts (I used praline almonds), etc. * Prepare pie crust as detailed on bag- mine said to let it sit and thaw for 15 mins, then bake for 12 minutes at 400degrees. Let cool. * For chocolate ganache: heat heavy cream on the stovetop over medium heat. Take off heat and stir in chocolate chips. Pour into the pie crust. Place into fridge for 15 minutes so ganache cools. * Once ganache is hardened, place single layer of banana slices on top of ganache. * Prepare instant pudding mixture. Mine said to mix with 2.5 cups of milk- I did a mixture of half milk, half heavy cream to thicken it up. Spread pudding mixture on top of banana layer of pie. * Let set in fridge until ready to eat. * Once ready to eat- top with a layer of whipped cream and slice. 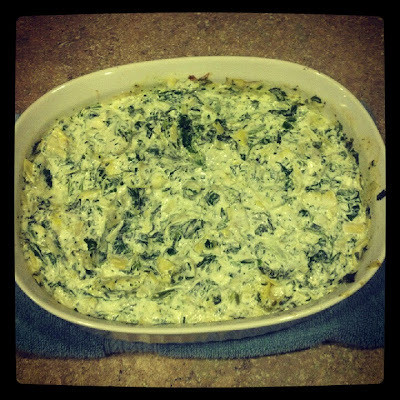 There are 1,000 recipes for spinach and arthicoke dip online. I found a really great one the other day and vowed to make it. Did I write it down or save it in any way? Of course not. Yesterday, we had a dinner get-together at our friends house and I told her how bad I wanted to make this dip. She agreed it sounded delicious- perfect for a stormy day. I fought the storm and the horrible drivers to Walmart (where you would have thought people were stocking up for the apocolypse since the shelves were empty- come on people- its just a little rain!). I got there and went to my phone to try and find the recipe so I could get the ingredients, but thanks to the storm, I had no internet. Dang. I tried to remember as much of the ingredients as I could and pushed my way through the crowds, through the self-checkout, and back out into the rain. I got soaked by cars driving by, got into my car, and carefully made my way to the highway. Halfway home I remembered I forgot a few things, but wasn't going back since the weather was getting worse. I figured I'd alter the recipe and make due with what I had. Back home, I was *thrilled* to find we had no internet at our place either. I guess I'm winging this dip! At the get-together later that night, both girls asked me for my recipe because it was so tasty! :) Woo! I told them it was literally just a random piling of whatever I had around, but I'd still like to chalk some of the success up to my mad cooker skillz! I can happily say this recipe is all mine! How about that?! * Combine all ingredients into a bowl. Mix well. Slow cookers are my best friend. Granted, I am home all day, doing nothing, so its not like they help me out in the 'I have no time to cook' department. I'm just lazy. I spend all day just playing with the boys, waiting for the hubs to come home. It just mostly happens that around the time I would usually start cooking dinner, both boys need to be fed/bathed/paid attention to so its always difficult to prepare food with them crying and running between my legs in the kitchen. Again, slow cookers are my best friend. This recipe is altered a bit. I found a recipe for creamy herbed chicken in my Taste of Home Slow Cooker magazine I picked up while waiting in the checkout line at Walmart. I couldn't find the specific packet of seasoning that was called for in the original recipe, so after about 20 minutes of looking and 30 curse words later, I gave up hope and went in search of the next item on my list. Turns out, in the dressing aisle, Kraft has pasta seasoning packages! Not exactly what the recipe called for, but I'm going to say it was a very successful substitute! I also added a little flour mixed with cold water to the liquid after pulling the chicken out of the slow cooker to thicken up the sauce so it could be poured over the noodles. I used fettucini noodles, but since it was a parmesan based seasoning package, it could very well have worked over some cheese tortelloni or something like that... delicious!